Democrats gained a net of eight seats, and recaptured control of the Senate from the Republicans with a 55–45 majority. Robert Dole (R- Kansas) and Robert C. Byrd (D- West Virginia) exchanged positions as the Majority Leader and the Minority Leader. James T. Broyhill (R- North Carolina). Broyhill was the only Republican who was defeated who had not been elected for the first time in 1980. However, Broyhill had been appointed to the seat that had been left vacant by the suicide of John P. East, a Republican who had been elected in 1980. Mathias announced his retirement from politics. At the time of this announcement, it was expected that then- Governor Harry Hughes would run for the seat being vacated by retiring Senator Mathias. However, Hughes became caught up in the aftermath of the Maryland savings and loan crisis. He lost popularity with voters, opening the door for Mikulski's bid for the Senate. Chavez won the primary handily, defeating several Republican challengers. Later, she made comments that some Mikulski supporters interpreted as an attempt to draw attention to the issue of Mikulski's sexual orientation. In an article quoting Chavez's claim that Mikulski was a " San Francisco-style, George McGovern, liberal Democrat", the Washington Post reported that Chavez was directly implying that the never-married Mikulski was a lesbian. [ citation needed] Chavez was accused of making Mikulski's sexual orientation a central issue of the political campaign. In defending her use of the phrase, Chavez stated the line "San Francisco Democrats" was a reference to Jeane Kirkpatrick's 1984 Republican National Convention "Blame America First" speech, in which Kirkpatrick coined the phrase "San Francisco Liberal. "[ citation needed]. The phrase "San Francisco liberal" was common at the time. Mikulski never directly responded to the issue and eventually won the race with 61 percent of the vote. [ citation needed] She was the first female Democrat elected to the U.S. Senate in her own right (not appointed or filling a seat of a deceased husband). Incumbent Republican Jim Broyhill, who had been appointed in June 1986 to serve out the rest of John Porter East's term, faced off against the popular Democratic former Governor Terry Sanford. There were two separate elections held on the same day: a special election for what little remained of the 99th United States Congress (November 1986-January 1987) and a regular election for a new six-year term (beginning in January 1987). Sanford won both elections. Terry Sanford, then the outgoing president of Duke University, first said in September 1985 that he was planning to run for the U.S. Senate the next year but quickly withdrew, as it appeared that the party wanted a "fresh" face, most likely in the person of UNC System President William Friday. Then, Friday declined to run, as did other well-known politicians like former Gov. Jim Hunt. 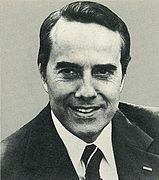 Former North Carolina Secretary of Commerce Lauch Faircloth then made it known that he would run, but he was considered too conservative by many party leaders, who encouraged Sanford to enter the race in order to defeat Faircloth. Sanford agreed to run, which led Faircloth and another candidate, Judge Marvin K. Blount Jr., to withdraw before filing their candidacies. Six years later, Faircloth did run for the Senate against Sanford, but this time as a Republican. Sen. East declined to run for a second term, citing his health. Longtime U.S. Representative Jim Broyhill entered the race with much of the establishment support, but David Funderburk had the backing of the organization of Senator Jesse Helms. Funderburk charged Broyhill with being insufficiently conservative, but in the end, Broyhill won the nomination handily in the May primary. The next month, Sen. East committed suicide, and Gov. James G. Martin appointed Broyhill to his seat. This was a special election for what little remained of the 99th United States Congress (November 1986-January 1987), being held contemporaneously with a regular election for a new six-year term (beginning in January 1987). Sanford won both elections. 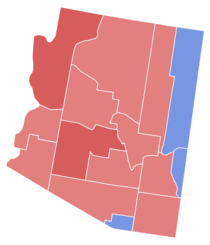 Incumbent Republican U.S. Senator Mark Andrews lost re-election to a second term to Dem-NPL nominee Kent Conrad, State Tax Commissioner. Andrews lost re-election by just over 2,000  votes after a rigorous campaign involving personal attacks and other strategies[ citation needed]. Incumbent Bob Packwood ran for re-election. U.S. Congressman Jim Weaver received the Democratic nomination. A populist Democratic congressman from Eugene, Oregon, he was a darling of the environmentalists. Weaver supported the Oregon Wilderness Act of 1984. Packwood was confident despite the popular opponent, because had more money and a better campaign organization. After winning the party nomination, Weaver was the subject of a House Ethics Committee probe into his campaign finances, and withdrew his candidacy. Rick Bauman was selected to replace Weaver on the ballot, and lost handily to Packwood.